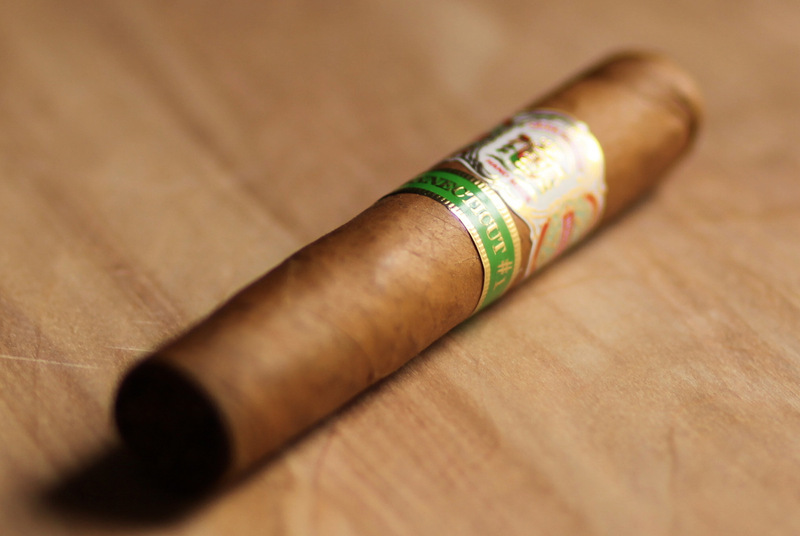 After reviewing the Gran Habano Corojo #5, I must admit I was not all that enthusiastic about reviewing the Connecticut. There’s usually a less-than-fun period of trial and error that every new cigar company and quite a few brand new cigars have to go through before they get their unique quirks resolved. Based (albeit solely) on my first G.R. cigar review, Guillermo Rico’s company seems to be in the thick of that period right now. On the other hand, I know and firmly believe that first impressions are never everything, so I’m accordingly happy to be going toe-to-toe with Mr. Rico’s Connecticut #1! 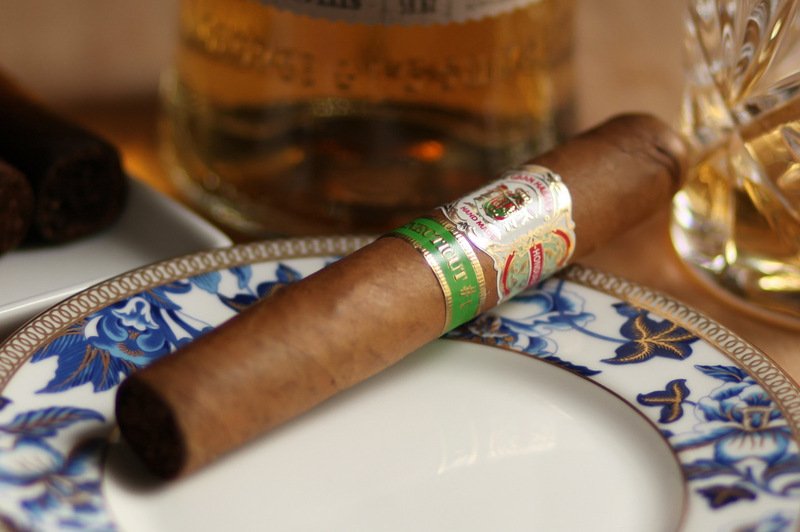 The Connecticut presents itself as a kind of sibling to the Habano Corojo #5. It’s body is quite tightly packed with no soft spots and very little flexibility. The wrapper is rugged and veiny, but very well-crafted and free of any breaches. This is especially the case with the cap, which is just as perfect as the Habano Corojo’s; evenly wrapped, with no seam breaches. The Connecticut has a hidden bonus, though; the cold odor is unlike anything I’d experienced up to now; a lovely and subtle sweetness that reminds me of, wait for it, a croissant. It quickly becomes apparent that the croissant-esque cold odor wasn’t just a pleasant fluke. The Connecticut #1 makes a smooth entry with a beautiful buttery bread foreground flavor that more than makes up for the predictably tight draw (which thankfully stays out of the flavor’s way). The aroma exuded by the velvety smoke clouds is just as sultry and buttery. The foundation is completed by a deliciously salty retrohale that perfectly complements the bread & butter of the foreground. There’s not much of a background flavor profile, but the foreground’s flavor once again more than makes up for it. The ash begins to split right down the middle at the start of the second third, but the burn holds its ground and stays even throughout. The retrohale also begins to strengthen with the addition of a sweet spice essence, which also provides an enriching contrast to the salt. The foreground’s bread begins to morph about halfway through into a flavor that almost tastes like sourdough, with the butter moving out of the foreground and into the background to provide a contrast similar to the one occurring simultaneously in the retrohale. The morphing of the foreground continues throughout the rest of the second third to the point that the bread tastes slightly immature, but not to the point of spoiling it. The point of convergence is slightly anticlimactic as the foreground flavor’s maturity doesn’t recover to its original glory, instead merely bringing its decent to a halt. As the sweet spice and the salt begin to fight each other for control of the retrohale, the butter in the background begins to slightly reassert itself into the soured foreground, though not quite enough to save it. The pull begins to singe the tongue surprisingly early on, but this discomfort is alleviated somewhat by something every smoker longs to hear; that delicious soft crackling sound as the smoke draws ever nearer towards its inevitable end. Much like its sibling the Habano Corojo #5, the Connecticut #1 displays great potential that has yet to be fully realized. The buttery bread foreground and the salty retrohale in the beginning of the experience made for a flavor profile that was downright heavenly. It also displayed a nice complexity when the buttery bread morphed into sourdough in the middle. Sadly, the middle was the pinnacle of the experience; the final third was a bit of a letdown as the maturity of the tobacco faded and the tongue singe began way too early. Again, however, this stogy has potential. I look forward to reviewing it again sometime in the future.